To go beyond just communicating corporate values, and encourage employees to truly believe in them, we developed a corporate culture collateral design that unifies teams across eight countries under one common goal. INOVYN is at the heart of Europe’s chemical industry. Used in almost every aspect of modern society, INOVYN’s products keep people healthy, housed, and connected. Their products are fundamental raw materials in – amongst others – healthcare, food, paints, automotive, construction, water treatment, paper and textiles. With over 4,000 employees globally, the company holds a highly competitive position. After a recent company restructure, the goal was to go beyond just communicating the corporate values in a simple yet highly effective way. The collateral had to do that, and much more. It had to unify INOVYN employees from as many as eight European countries under one common vision. It had to energise and encourage individuals to own and embrace the values, and bring local and international teams together. 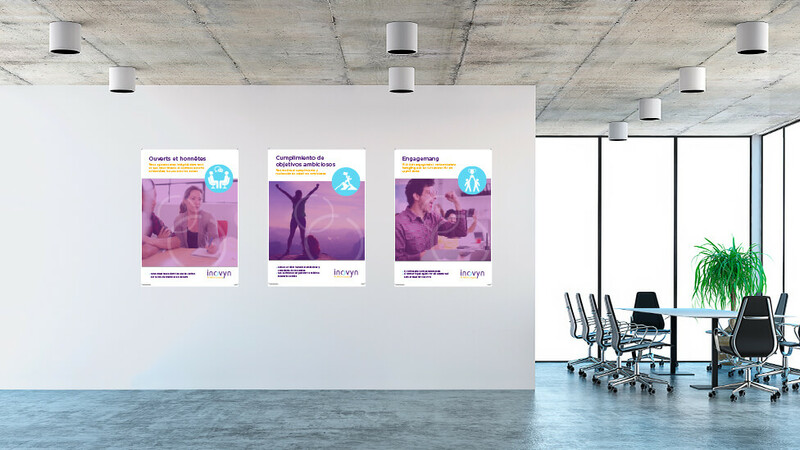 To maximise exposure to the corporate values, and encourage employees to live and breathe them every day, we focused our efforts on larger format and highly visual printed collateral – posters and pull-up banners. Placed in areas of high traffic, or particular significance within the corporate office environment, the collateral speaks the corporate values across INOVYN’s global locations. The style of the corporate culture collateral design relies on simplicity to guarantee effectiveness, leaving room to process the messages transmitted by the corporate values. To inspire collaboration, people are the focus, with strong lifestyle and conceptual imagery transmitting a mixture of energy and collected contemplation. Images illustrating scenarios employees face every day sit behind a subtle layer of the corporate brand’s purple – the company values permeate everything.